Super Typhoon Maria's seven nautical-mile wide eye appeared very clearly in a visible image from NASA's Aqua satellite on July 6. 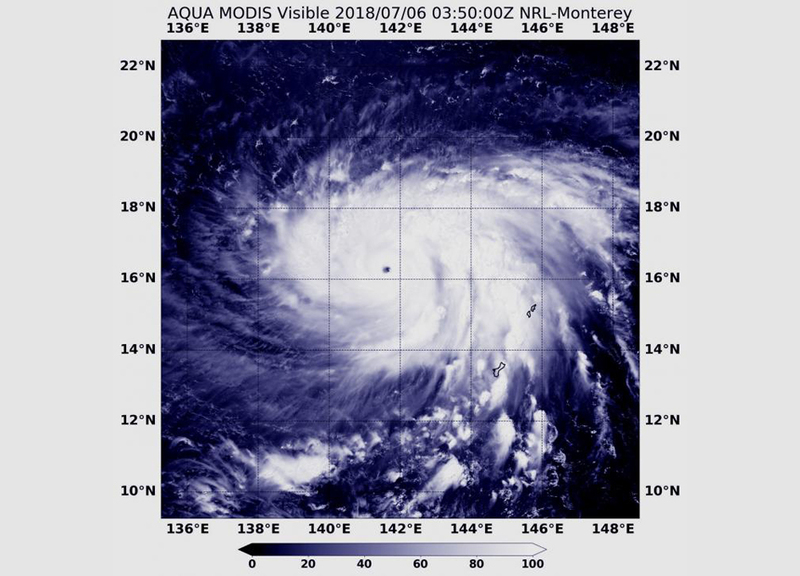 When NASA's Aqua satellite passed over the Northwestern Pacific Ocean on July 6 at 0350 UTC (July 5 at 11:50 p.m. EDT), the MODIS instrument or Moderate Resolution Imaging Spectroradiometer provided a visible-light image of Super Typhoon Maria. The MODIS image revealed a clear, small eye, surrounded by a powerful ring of strong thunderstorms. At 11 a.m. EDT (1500 UTC) on July 6, 2018, the Joint Typhoon Warning Center (JTWC) noted that Super Typhoon Maria was packing maximum sustained winds near 155 mph (135 knots/250 kph). Maria was a strong Category 4 hurricane on the Saffir-Simpson Hurricane Wind Scale. Maria's eye was centered near 17.0 degrees north latitude and 141.2 degrees east longitude, about 480 nautical miles south of Iwo To island, Japan. Maria was moving to the northwest at 4.6 mph (4 knots/7.4 kph). At that time, the JTWC noted that the "sharply-outlined 7-nautical mile wide eye that has constricted over the past 12 hours. This reduction in eye diameter plus the formation of a secondary outer eye wall, as observed in recent microwave images, indicate the cyclone is undergoing an eye wall replacement cycle." JWTC said that Maria is forecast to continue to move northwest. The system is intensifying rapidly, and will peak as a Category 5 hurricane on the Saffir-Simpson Hurricane Wind Scale at 161 mph (140 knots/259 kph) on July 14. The storm is expected to start weakening slowly on July 8 en route to the Ryuku Islands. Maria is forecast to speed toward Okinawa and pass just to its south, into the Yellow Sea and July 11 make landfall to the south of Shanghai near Taizhou, China.